How many of you are already dead set in getting the next Gen 8 games. Discussion in 'Pokémon Sword & Shield Discussion' started by shoz999, Nov 10, 2018. All those in favor of dead-set getting Gen 8 games! Say Aye! All those who oppose! Nay! All those in favor of dead-set getting Gen 8 games! Say Aye! All those who oppose in favor of a wait-and-see approach! Say nay! Who the hell makes a decision to get games that have little info released? Ignition, Alola Adventurer, M.P. and 2 others like this. I believe the word is called fan loyalty? Something that is only gained by consistent trust and quality and delivered promises, something GameFreak has a history of compared to other more controversial game companies. For others it's simply curiosity but I understand where your getting at. Sure, I'll be getting them. I have to continue the collection. I can't imagine a scenario where I don't end up getting it. It's my go to game series. I highly doubt there's any reason (other than death) that would make me not buy a Pokémon game, I've been deadest on Let's Go for its cute uniqueness, but a new core game with all these new 3D models on my TV? Without a doubt any game coming out will get got. I am. LGPE will keep me busy until Gen 8 comes out. Not yet. As Dragalge said, there's too little info released, and I don't have a Switch (whether I'm going to get one highly depends on how the Gen 8 game turns out). Though I don't always go for sequels or remakes, brand new ones (region/gen) I always get. It would have to be terrible for me not to get a "new-new" pokemon game. Because I find it kind of dumb to pretend otherwise, yeah, buying the next games is virtually a given for me. I'm buying LGPE, and so I think to say I wouldn't at least purchase the Gen 8 games and try them out - regardless of most directions they could take - is a little silly. I've been following the series for 17 years now, I'm going to pick up a game and play it before giving up on the series, even if it's clear before hand that it has a high chance of being terrible. This. It is beyond foolish to decide you're getting a game that you know nothing about. You can be excited for an upcoming game, but making a decision on absolutely nothing? There's fan loyalty and then there's blind loyalty, and this would be the latter. Just because Game Freak has done things you like in the past, doesn't mean they'll continue to do so. Doubly so with Game Freak, who continues to make decisions and change things up at their own whim. Also consistent trust and quality? What franchise are you playing? Pokemon's quality has definitely wavered in recent years, with features being removed, content decreasing, and increasing casualization. Game Freak is falling closer and closer into the category of the controversial game companies. Dragalge and Foxtrek like this. Not really, I've seen your past arguments and it seems to be critical on how they remove slices of details and features over time, ignoring much of the technical, graphical and creative improvements the series has made over the years. You've also used Let's Go as an example but that doesn't really work because A) that's a seperate series and B) it's still too early to judge, the overwhelming change in opinion of the games after the recent Let's Go trailers as proof of that and not to mention USUM's similar history. In fact the fans divisiveness on what are the greatest and worst generations of games is huge proof alone how much GameFreak has put quality and care into their series. Series that have a much more consistent opinion of what the majority of fans think are the best and worst games, for example Sonic is an obvious contender, can show how much the quality has drastically changed, in the case of Sonic decline. Pokemon doesn't belong on the same level as Sonic, Call of Duty or Mass Effect because of how divisive the fanbase is. This divisiveness is due to how much quality and care GameFreak puts into each game, earning a lot of respect and favor-ability among the fan-base to each game, that games are often compared to which has the best and worst quality but only by comparison. Alone, they stand as strong games. It's due to this that the quality among Pokemon games are incredibly divisive. One may think HGSS is outstanding for it's many little details, like walking Pokemon, or successfully remaking two regions but others may think Sun and Moon is outstanding for it's technical and graphical leap that pushed the 3DS to it's limits and able to tell a compelling story. In fact, from the sound of your arguments, I'd say your not arguing that Pokemon's quality has gone down rather... it sounds like you hate how slow the series is evolving compared to other series that have gone open world or pushed state-of-the-art consoles to their limits. I guess me and at least 13 others are beyond foolish then. I've just ordered the Ultra games so i'm going speed through them just to get the new Pokemon that were introduced, only need like 4. I'll definitely be getting the Gen 8 games, i got back into Pokemon with the X&Y games and have loved it since, i've took quite a few breaks because i was wanting a living dex. Kanto-Complete!!! 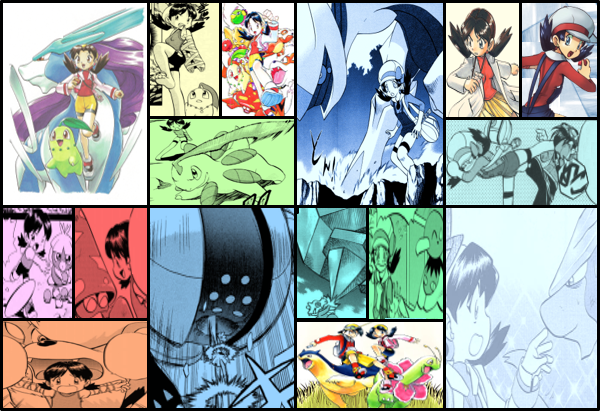 / Johto-Complete!!! / Hoenn-Complete!!! / Sinnoh-Complete!!! / Unova-Complete!!! How much content is in a game is a large part of its quality though. A game is, first and foremost, supposed to be an entertainment device. If they're not including enough to keep the player satisfied, then it's ineffective in entertaining them and therefore not as high quality a game. It's not enough to just improve in technical and graphical aspects over time to create an experience as complete and high quality as they can. They have to improve in everything across the board, so yes, that means including as many features as possible and keeping up with technology. Fans having split opinions is not really a good thing. When the opinions are split due to complaints about the series rather than its merits, and there is a lot of the former in this series, that's a sign that the series isn't doing a good job of satisfying its base. So yes, I would put the recent Pokemon games in with the likes of Sonic, CoD, and Mass Effect. I will be. I’ve picked up every main series games since Blue so I’m definitely getting these. What I’ve been thinking of doing though is skipping the initial release and waiting for the improved third version as Switch games are a lot more expensive than 3DS games and I almost never go back to the original versions. Not really sure as $60 is a bit harder to stomach for the games to continue with the 2 initial versions + 3rd version format. At the very least should they go with a sequel as the follow up to the initial pair or anything that would be 3rd version content is released as free DLC somewhere down the line. To each and their own I guess but I need to correct you on what I mean by split opinions, it's partly my fault for mis-wording it. The word I meant to use what diverse, not divisive. The sonic fanbase is divisive, split into mainly two types of Sonic fans. The Pokemon fanbase on the other hand is diverse in opinions, not split, not polarized, diverse in a range of opinions that say what their favorite or worst generation is thanks to the varying degrees of quality. I'm not saying the Pokemon fanbase is split, I'm saying that their is great range of different compelling personal opinions, such as yourself, from a wide variety of the fans that no one can truly come to a common agreement on how the quality has been raised or declined, or what is the best generation or the worst generation. This is proof that GameFreak has maintained consistent quality and care throughout the series. Perhaps it's declined a little but it's been quite consistent that GameFreak won it's fan loyalty. That is why almost everyone is excited for what GameFreak has in store of Gen 8 even though they haven't revealed much because it could be anything. Gen 4 we had the snowy mountains of Sinnoh. Gen 5 was the industrious cities of Unova. Gen 6 was the beautiful Kalos region that looked like it was out of a fairy tale. Gen 7 is a tropical paradise of the Alola region. People are excited what GameFreak has planned for the future, even when their not telling us because it's always a nice surprise. I didn't get the Ultra games, and I'm not getting the let's go games either, GameFreak's going to have to do their job as a company and convince me their product is worth 60$ because they couldn't convince me the last two batches were worth it, and say whatever you want, but I didn't get 40$ worth of enjoyment out of Sun/Moon so they're going to have to work for my money this time. janejane6178, GarchompTheAssassin and Bolt the Cat like this.